style="text-align:center;"> Please note that this topic has not had any new posts for the last 867 days. 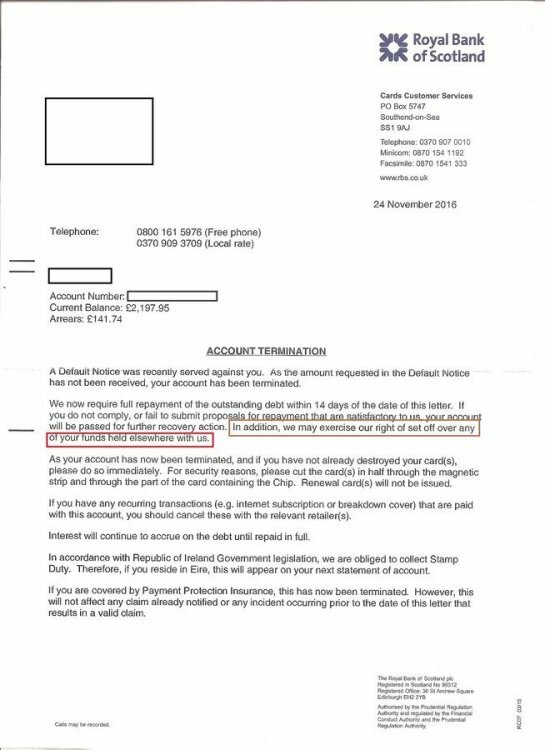 My bank has threatened me to set off my funds I hold with the bank current account and savings against any debt owed? Can they do this legally without my say so or do they require approval from the court. I don't hold bank accounts with any other creditors which I have credit cards, which is a good thing, however could those creditors access my bank account without my authority is that not a crime? If you owe a debt with them, then yes they can. However they can only do it within their own group of companies. So halifax cant do it to coop etc. so the bottom line is...do you have any other accounts? One of the negative's with having more than one account with the same Banking group. Gawd blimey your arrears are for £141.74 & they really going to terminate your account on that basis!! If this were me, that is what I would do whilst sorting out the issue with the RBS. Hope you manage to get this sorted out! I don't suffer from insanity, I enjoy every single minute of it!! Yes, there is a right of set off. Although I expect they would never admit it, I also think that there is a duty of set off. If you have two accounts and one is in credit and one exceeds its overdraft, the bank will normally simply apply excessive charges to the overdrawn account without troubling to use credit in the other account to make up the shortfall. This allows the bank to milk you for excessive charges and inflated interest by increasing your level of overdraft on the exceeded account. I have always believed that if you have rights then they are accompanied by duties. I have always believed that if you have an account which passes overdraft limit then the bank has a duty to make up the shortfall from your account in credit rather than to push you even more over the edge. Of course, this is disadvantageous to the bank because they make less profit. I'm convinced that if somebody troubled to bring an action under BCOBS on this that they would win easily. Under BCOBS the banks are obliged to have regard to the customers interests when making any decisions. It is clearly in the customers interest to take action to reduce their exposure to excessive charges. It is clearly in the banks interests simply to keep on penalising your overdrawn account. The bank refused to lower my monthly payments from £50 to £20. They also have refused to send me the original contract (not agreement) also refused to send me a deed of assignment and a bill of payments. They have also harassed me by calling my home phone number and sending threatening letters to a man diagnosed with anxiety. They don't care about your interests really anyone who believes that is brainwashed. All banks and debt collection agencies are insured against losses. In fact they make profits from your loss they sell your debt on and get a fee then they claim back from a insurance company on outstanding amount. They do pay a fee to these insurance companies however its peanuts for them. Youll never get a deed of assignment. Its private business information. I think youve been reading info from a FOTL site. get an sar running to them. what could a SAR do? they are supposed to take into account any financial difficulties. as bankfodder mentioned re bcobs/ conc. is the matter re the rep of ireland. stay off those fmotl sites bh. they'll do you no good and only you make you look a fool in their eyes thinking you are a pushover freeman of the land.